Rejection stinks! No matter where you are on your journey as a writer, it never gets to be much fun … I’ve heard it from some of the best paid writers out there … it happens. 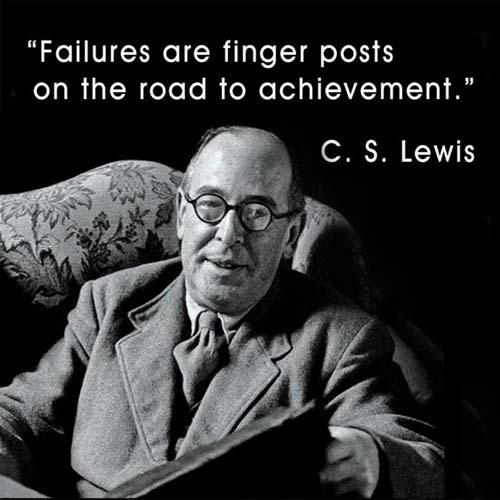 For me, this definition of success rings most true. 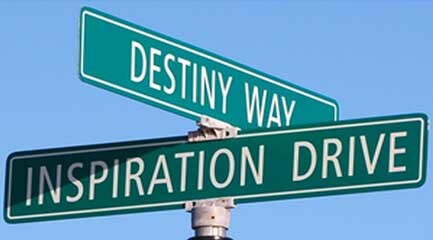 If your purpose is to finish your novel to your own satisfaction, then, in doing so you have been successful – you are a successful person, what you did takes some doing, reward yourself for that in well-deserved acknowledgement. It’s when we seek more than that, that we can set aside that remarkable success and begin to measure the success of our accomplishment in volume-distribution and dollar terms. In doing so, the initial achievement can so easily become tainted, mudded even, in the process. Fame and fortune are blind. They embrace the worthy and the not so worthy in equal measure. The sooner you get that firmly fixed in your head, the sooner you will be at peace with the world. Putting your best foot forward only to have it stamped on takes a bit of getting used to, but if you fix your mind firmly on the true definition of success, you will cope with rejection and begin to take it less personally. In my blog, “Presenting Your Work To The World” I covered the importance of targeting your efforts to get noticed and in doing so, heavily reduce the pain of having your work come back the other way. THE PACKAGE WAS PERFECT – WHY DID IT COME BACK? 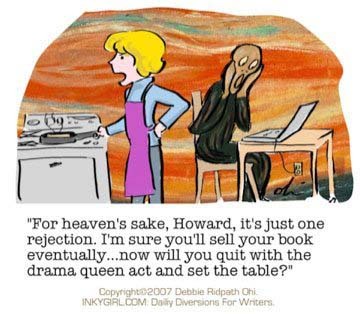 There are many reasons a writers work is rejected. 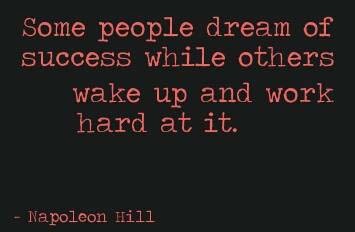 The two most common are easy: It wasn’t good enough, or it wasn’t what they are looking for at this time – hopefully they will tell you which. Either way, you’re lucky to get an acknowledgement at all, because many are so inundated with unsolicited manuscripts that they simply don’t even acknowledge receipt. Accept it, notch it up as another step toward finding your match and move on. DON’T GIVE THEM ANY EXCUSE TO REJECT YOU! Putting the right foot forward was cover in my blog: Presenting Your Work To The World, But here we’re dealing with the fall out when your work comes back the other way. It starts with the bundle itself. Many agents, publishers, reviewers and the rest will look for anyexcuse to cast your unsolicited manuscript aside without even reading it. An untidy presentation: dog-eared pages or a prior viewers notes – anything. An unprofessional covering (query) letter, both in look, feel and content. A manuscript that does not conform to their individual requirements for layout. A less than enticing opening to your story – first paragraph, sometimes even that first sentence, has to grab their attention. Inadequate or unclear contact details. The full list is probably many times longer, but you get the drift – make sure your submissions are everything they can be – again, see Presenting Your Work To The World, for more. It seems to me, from what I’ve read in accounts written and spoken of by many of the worlds best respected authors, it goes with the territory. 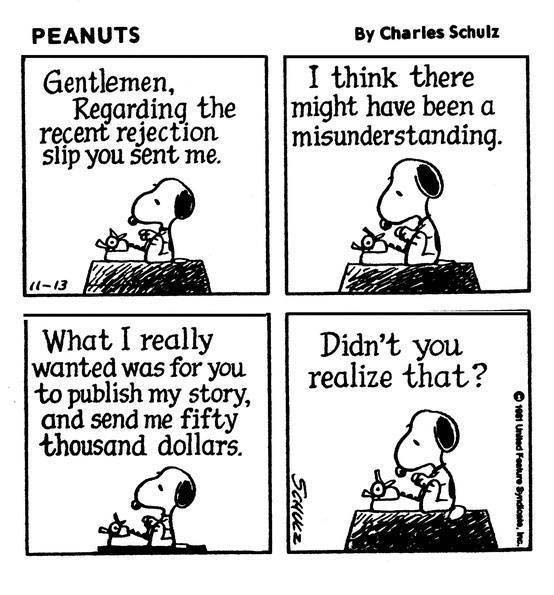 Snoopy – dealing with rejection. Hey! Your work has been noticed enough to have you suffer your first critical review? WOW! You’re on your way! If you know in your heart that your work has value then you have to remember that a critical review is just one person’s opinion – As someone once said, “Everyones a critic!” Let it go! On the other hand if the majority of the critical views offered about your work are negative, maybe it is time to take another look. 2) Nothing has greater influence on buyers than the views and opinion of other ordinary folks with no axe to grind. “Word of mouth” is an incredibly powerful force. Keep a firm eye on both professional and public reviews of your work. Their opinions matter. 1) Give up, go down, get depressed. 2) Work to write something so good it can’t be rejected. From what I’ve gathered over much research on the business of ‘rejection’, for every five thousand unsolicited manuscripts sent out to agents and publishers each year, may be two new authors will get signed up! That’s how tough it is. 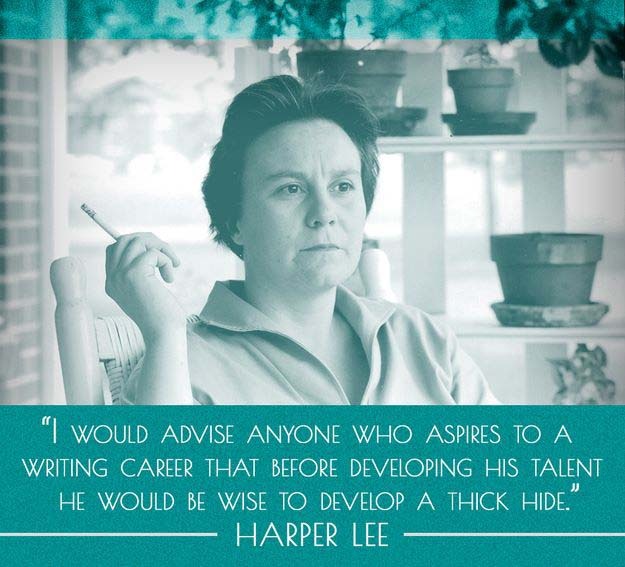 Be your absolute best, in your writing, your presentation, your targeting, and your dogged determination. This entry was posted in Dealing With Rejection on 2019-03-30 by JohnDMoulton.